What were your favorite things to take in your lunchbox as a kid? Mine was always peanut butter and jelly sandwiches. Actually, I still love peanut butter and jelly, but I love playing around with different flavors and combos in my sandwich too. 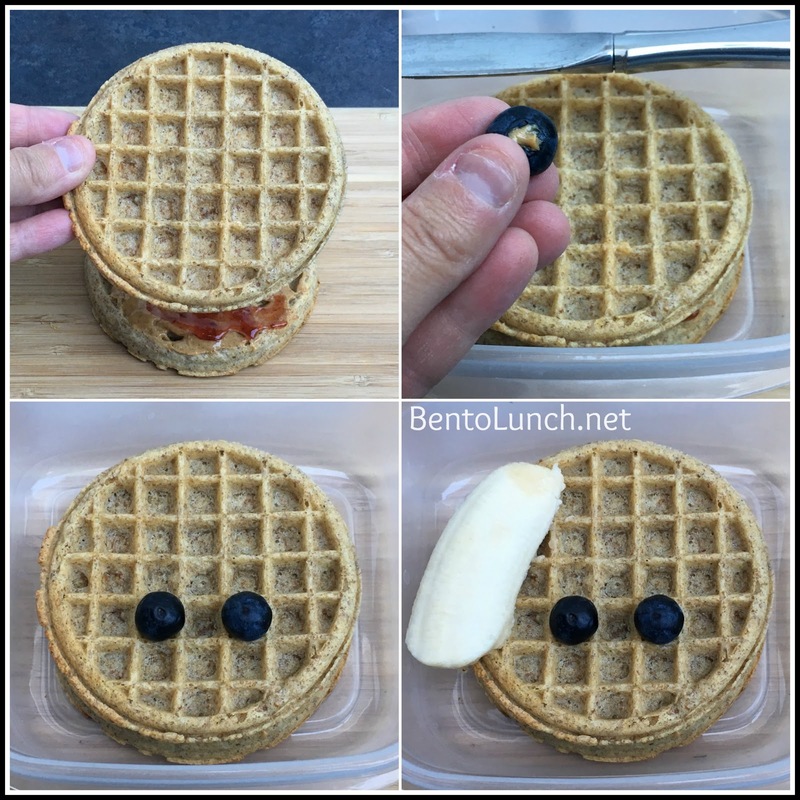 We started working on some fun back-to-school ideas, which also worked well for Ben's summer soccer camp lunches. 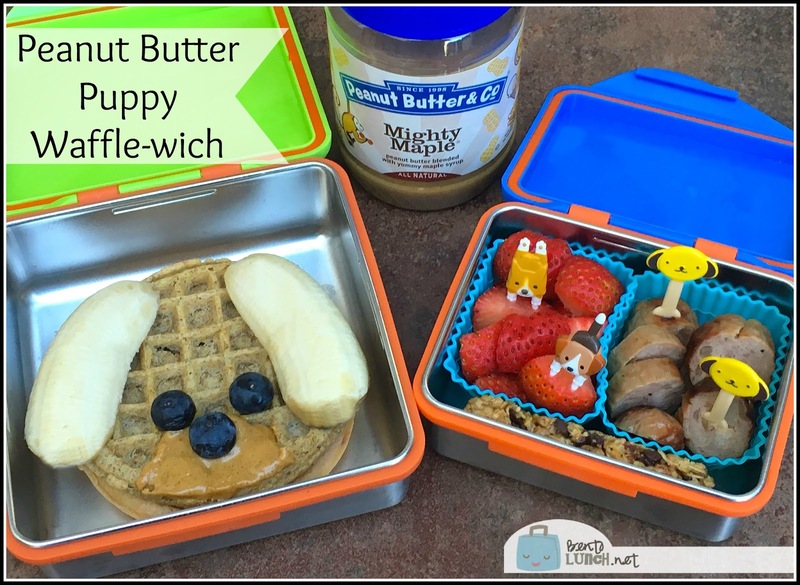 Out of all of different ideas, we are really loving this Puppy Wafflewich Bento, which gives a fun spin on the traditional peanut butter and jelly sandwich. 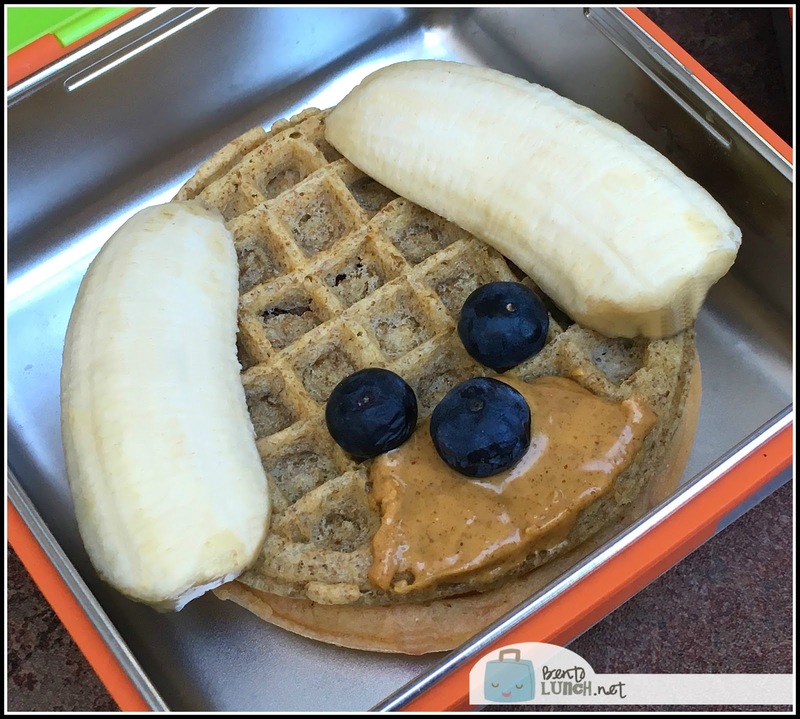 Yummy whole grain waffles are topped with Peanut Butter & Co. 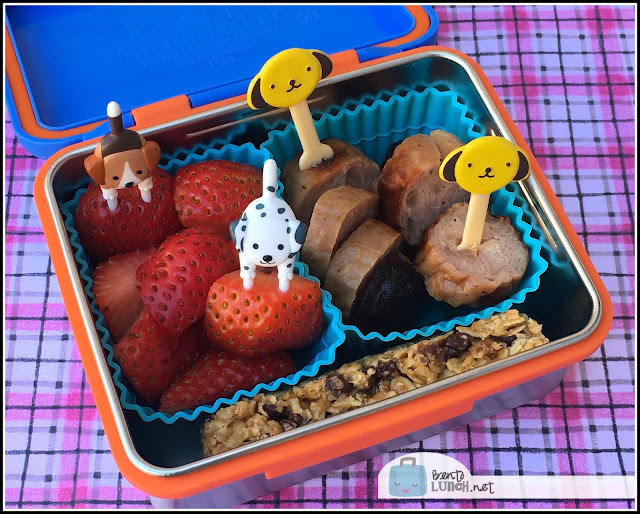 Mighty Maple Peanut Butter and strawberry jam for a great twist and a cute puppy is constructed from your lunchbox fruits! Toast your frozen waffles and let cool. Spread one waffle with a layer of Might Maple Peanut Butter. Spread a layer of strawberry jam on top of the peanut butter and top with the second waffle to make a sandwich. Using a butter knife, place a dab of peanut butter on the bottom of two blueberries and press into the waffle grid to make eyes. Take the top half and slice in half length to make ears. Place on top of the waffle, using dabs of peanut butter to secure in place as needed. Spread a small half circle of peanut butter below the eyes to make a muzzle. Top with an additional blueberry for a nose. Slice your favorite sausage into rounds and place in a silicone muffin cup. We chose grilled chicken apple sausage for ours. Decorate with a puppy fork pick. Slice strawberries into pieces and place in a silicone muffin cup. Decorate with another puppy fork pick. Add a granola bar to hold the silicone cups in place, then pack a yogurt and a drink to finish the meal! Pack your lunch in a great Kid Basix Safe Snacker, we chose two different sizes to hold our full lunch. What are your favorite peanut butter and jelly combinations? I'm always looking for new ideas! Disclosure: This post was sponsored by Peanut Butter & Co. I was provided with product and compensation for the purposes of this post. All opinions are my own. These look so cute! My son tosses his backpack all over the place so I wonder what it would end up looking like by the time he got to it! ha! Yummy! I am new to making packed lunches as my two oldest start Kindergarten in the fall...this is great inspiration, thank you! Oh my, too cute!! Tomorrow I'm making a doggy breakfast! 2 of my favorite things... puppies and chicken sausage! I love those little puppy toothpicks. I actually really love a good PB&J wrapped in a tortilla. No way! Those toothpicks are super cute, too. Are they re-usable/washable? My daughter refuses most meat, but if I use those toothpicks, maybe they'll make the food more appealing! Love this idea! I have wanted to try making Bento lunches. Will definitely be revisiting your site!